Continuing our etymological tour of the capital. This article is not intended to provide a detailed history on each bridge, but merely to look at the origins of their names. If you want to know more about the order of construction, here's a neat little video to help. This is now the only bridge in London that crosses over into another county (Surrey). Its red-brick span, with classical stylings were designed (partly by Sir Edward Lutyens) to match nearby Hampton Court Palace, after which it is named. The Palace in turn takes its name from the nearby village of Hampton, originally an Anglo-Saxon settlement whose name probably derives from a small farmstead on a bend in the river (Hamm + ton). Kingston-Upon-Thames, on the ancient Wessex/Mercia border, was a stupendously important place in medieval times. As many as eight English kings might have been crowned here, and the putative coronation stone on show near the Kingston Guildhall is one of London's oldest monuments. No surprise, then, that the name simply means 'King's estate'. It was first recorded in 838 as Cyninges tun. Teddington is usually considered the point where the river ceases to be subject to the tides. For this reason, some have claimed that the name is a corruption of 'tide's end town'. This is not so, for the tidal reach would have been further upstream in ancient times. It's thought that Teddington is derived from a personal name, perhaps a local land owner, and was first recorded as Totyngton in the Anglo-Saxon period. You can cross at this point via a combo of suspension and girder bridges. 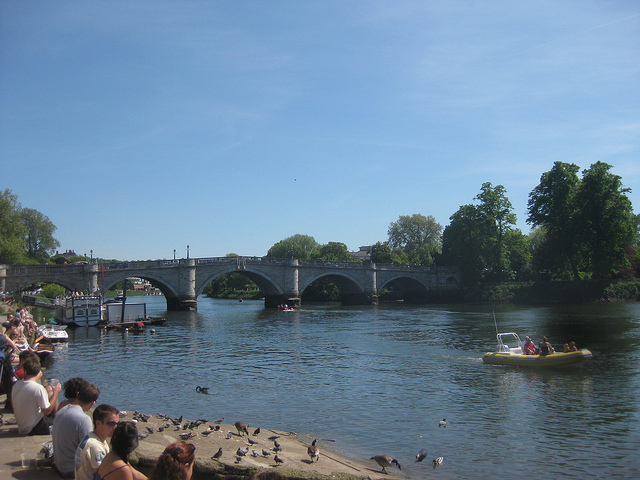 The only surviving London Thames bridge from the 18th century, Richmond Bridge and its two neighbours are, of course, named after the adjoining settlement. But that place is not as ancient as some might think. Before Tudor times, the area was known as Sheen (still in use, further from the river). Around 1500, Henry VII built a Thames-side palace here, naming it after his North Yorkshire Earldom of Richmond. That northern territory was, in turn, named after Richemont in Normandy, which translates rather predictably as 'rich hill'. Twickenham might be intimately associated with rugby, but the namesake bridge has closer associations to football — it was designed by the same architect (Maxwell Ayrton) as the old Wembley Stadium. The name has been around since at least 704 AD, when a document refers to the land as Tuiccanham. The original meaning is uncertain. It may refer to the land of a man called Twicca, or else derive from the word twicce, which meant river fork (this being near the place where the rivers Thames and Crane meet). Odd name, Kew. It's thought to be a contraction of Kai, meaning landing place (hence 'quay'), and Hoh, meaning a spur of land. Another interpretation has the name meaning a key-shaped piece of land. Either way, it's first recorded in 1327 as Cayho. In one of our favourite derivations, Chiswick is Old English for 'cheese farm', and was first recorded as Ceswican around the year 1000. The combined rail-footbridge takes its name from the nearby settlement of Barnes, which is first recorded in Domesday Book as Berne, probably referring to a barley store (i.e. a barn). Hammersmith has disputed origins as a place name. Some sources suggest it derives from Hammoder’s Hythe (a safe haven belonging to Hammoder), others, perhaps more satisfyingly, suggest it’s simply a concatenation of ‘hammer’ and ‘smithy’, denoting an area important for metal working. Like Hammersmith, the origins of Putney are murky. It's first recorded in Domesday Book as Putelei, but where that term comes from, nobody is sure. Some sources make a link to the Old English word Putta, meaning hawk, though it could equally stem from a personal name. Fulham was an area belonging to an Anglo-Saxon called Fulla, but rather than the usual ‘ham’ meaning homestead, this one was originally ‘hamm’, signifying a bend in the river. Bridge, town and borough all take their names from the River Wandle, which remains one of the delights of the area. The Wandle got its name from an Anglo Saxon called Waendel, who owned land round here. Another Anglo-Saxon name, Battersea was originally recorded as Badrices īeg, meaning the island of Badric. In ancient times, the Thames would have been much wider and shallower, creating small islands where now there is continuous land. St Mary's Battersea was the centrepiece of one such island where the Falconbrook met the Thames. Like a precursor to the Millennium Bridge, this delicate pink and green structure was known as the 'trembling lady' after its opening, thanks to its tendency to vibrate when large numbers of people walked in synch. Signs at either end still request that troops break step when marching across. It's named, of course, after Albert, consort to Queen Victoria — partly in tribute to the late prince, but also because its construction had been his idea. Chelsea crops up in various ancient spellings along the lines of Chelchith, meaning the landing place or wharf for chalk. Chalk was a useful commodity used in fertiliser. This raises the interesting notion that the phrase 'as different as chalk and cheese' might have its origins among the medieval denizens of Chelsea and Chiswick. This is the railway bridge heading out of Victoria station and across to Battersea — and also London's widest bridge, although it might also be considered as 10 parallel spans rather than one bridge. 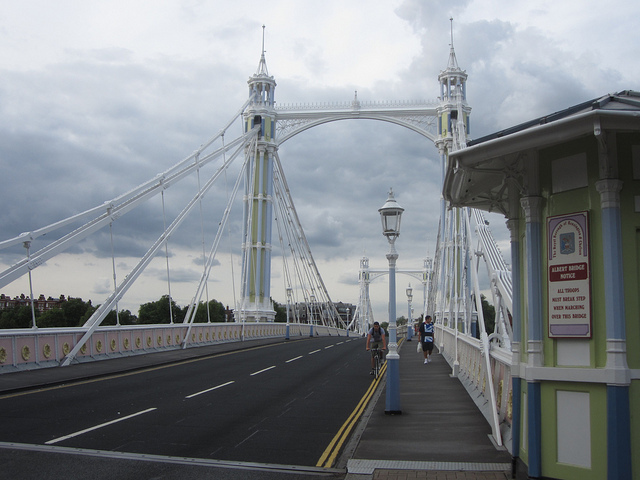 It was the first railway line to cross over the Thames and was originally called Victoria Bridge (as, occasionally and confusingly, was nearby Chelsea Bridge). It gets its name from the Grosvenor family, upon whose land Victoria station was built (and before that, the Grosvenor canal and basin). The Grosvenor name can be traced back to Hugh Le Grande Veneur, one of the French nobles who came across with William the Conqueror. The name translates as 'the master huntsman', making this the only London bridge to be named after a blood sport. 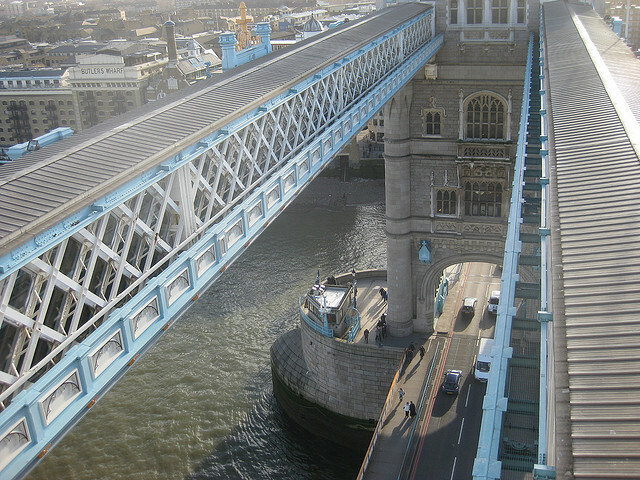 Another Anglo-Norman soldier (see also Grosvenor) puts his name to this bridge. Falkes de Breauté was a 13th century knight who built a hall in this part of south London. It became known as Falkes' Hall and eventually Vauxhall. His legacy continues in several other guises. The Vauxhall car company uses Falkes' griffin device for its own logo. Meanwhile, the Russian term for a mainline rail station is pronounced vokzal, and may well have a connection to the London area. Rather satisfyingly, the name means ‘landing place for lambs’, and it’s a shortened version of the earlier Lambehitha (hitha being a common ending for riverside landing places like Rotherhithe). The name relates to the famous Abbey — ‘mynster’ being Old English for a church. The ‘West’ part simply denotes it as west of the ancient City, and its great church of St Paul. In Anglo Saxon and early Norman times, the area was known as Torneia or Thorney Island, for an islet of that character, upon which the abbey and Palace of Westminster are built. Hungerford's one of those names that's all but vanished from the map, but it was once a well known market where Charing Cross station now stands (a small echo of market stalls can still sometimes be found hidden away at the raised level between the station concourse and the pedestrian bridges). The market got its name from Hungerford House, which occupied the site until its destruction by fire in 1669. The Golden Jubilee Footbridges were appended in the 21st century to celebrate Queen Elizabeth II's 50th year in the same job (imagine the redundancy package she must be entitled to by now). The bridge was under construction at the time of the famous battle (1815), in which the forces of Napoleon were defeated by Wellington and von Blücher. It was to have been called Strand Bridge, but the military victory immediately prompted calls for a ‘Bridge of Waterloo’. The span opened two years later as the slightly snappier Waterloo Bridge. The Belgian place name Waterloo translates roughly as 'wet clearing in the forest'. 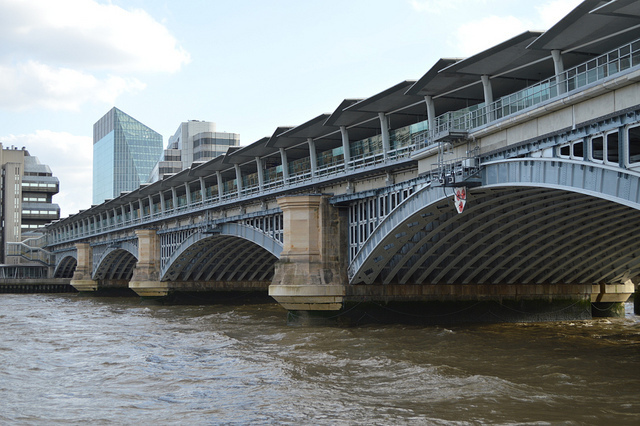 Blackfriars railway bridge, the only station to span the Thames. The two bridges are named for a priory of the Dominican order, established at the foot of Ludgate Hill in 1276. Dominican friars traditionally wore black garments, and hence their hangout became known as Black Freres (black brothers) and later Blackfriars. These are therefore the only bridges to get their names from an article of clothing. Also known as the Wobbly Bridge, thanks to a now-corrected eccentricity, the pedestrian span has a rather obvious official name, opening around the turn of the Third Millennium. Although this is one of the capital's newest bridges, plans had been kicking around since at least the 1920s to build a crossing at this point. This ancient part of London was settled by the Romans. Early records call it Suthriganaweorc or Suthringa geweorche, meaning ‘the defensive works of the men of the south’ (i.e. Surrey). Counter-intuitively, this bridge and the street that it serves have nothing to do with either religious canons or explosive cannons. Cannon Street is, rather, a 17th century shortening of Candelwrichstrete — the street of candle makers, as first noted in 1190. The origins are still hinted at today; Cannon Street falls within the Ward of Candlewick, one of 25 ancient subdivisions of the City of London. Some form of bridge has existed on or near this site since Roman times, and for many centuries it was the only fixed crossing in the capital. Only natural, then, that it should take the name of the city it serves. The origins of the name London itself are highly contentious, and could form the subject of a whole article. Which, handily, we've already written for you. A view few get to see. No mystery here. 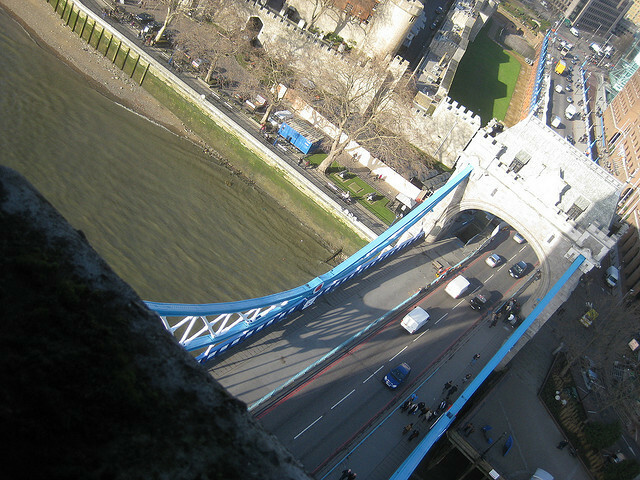 Tower Bridge is right next to the Tower of London. This medieval palace gets its own name from the White Tower, the keep at the heart of the complex, which was once coated in whitewash. *Pedants' note: depending how you count. The Golden Jubilee Footbridges and Hungerford Bridge all cross at the same point, and might be considered as one bridge or three, depending on the context. 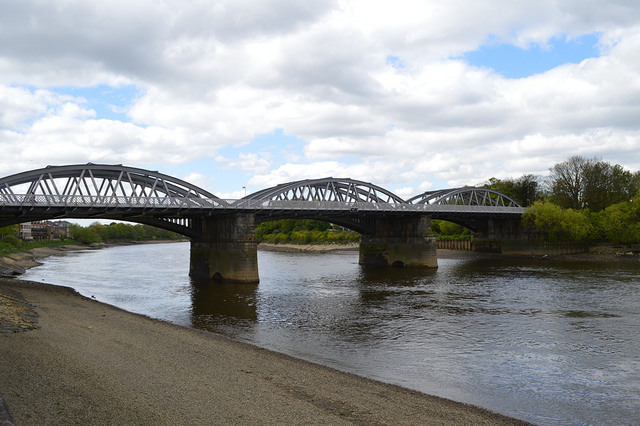 In addition, the Teddington crossing comprises two separate spans linked to an island.